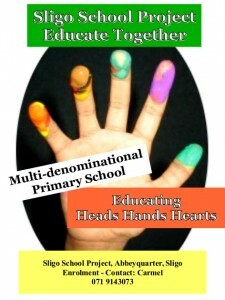 Sligo School Project is a multi-denominational primary school, affiliated to Educate Together. It caters for children of all religious, cultural and social backgrounds equally. In the everyday life of the school the children experience an environment that is characterised by mutual trust and respect. The entire atmosphere in the school is characterised by an informal, and yet reliable and trustworthy climate. Creating and maintaining such a climate leads to an exceptionally good relationship between children and adults, which eventually also impacts on the learning experiences of the children. However, it requires some conscious efforts on the side of staff and parents, to support this climate. Obviously Sligo School Project teaches the national curriculum covering the entire subject areas just as any other primary school. A particular focus in the school lies on physical activity and sport. The children get lots of opportunities during the day to move, which also includes a great variety of P.E.-activities. Acting out their need for physical activity is a very good basis for a more concentrated work atmosphere when it comes to the academic side of learning. The children greatly appreciate this mix of activities during the school day. In the weekly school meeting children and adults openly discuss all issues that come up between them, with a particular emphasis on interpersonal relationships. A ‘buddy system’ is in place in the school whereby the older children act as support for the younger ones. The various age groups mix a lot in everyday school life. In Sligo School Project children and teachers address each other on a first name basis. For the children here the adults are Carmel, Deirdre, Máire and Agnieszka. Also, the children all wear their own clothes, there is no school uniform. In general it can be said that each child is accepted in her or his individuality, and is allowed to express it. The teachers focus a lot on helping the children to build up their self-esteem, and at the same time become self-responsible in their social environment. It is the understanding of Sligo School Project that learning in school needs to be more than just pen and paper exercises in a classroom. Surely such exercises happen in the school as well as in any other school, but a lot of the learning activities also involve learning through discovery. The children engage with topics in multi-faceted ways, be it in science, history, geography or any other subject area. This includes very frequent excursions to places like the local library, the IT, the local theatres, and the immediate surroundings of the school. Due to the multi-denominational character of the school there is no religious instruction in Sligo School Project. Instead the children learn about different religious and ethical systems. A close contact between home and school is essential for providing the best possible learning environment for the children. Parents are welcome to meet the teachers and principal at agreed times whenever requested. Families who consider sending their children to Sligo School Project can contact the school with their inquiries at ph. 071 9143073.